The Disruption Begins – Let's Go Be Great! Traditionally advertising and marketing were based on the hope of a random chance. You’d see an ad at just the right time before you were going to buy or, as you walk down an aisle in a store, you’d see a display that would catch your attention. Brands were built through the strategy of frequency and reach. With enough positive impressions a brand could create an idea in your mind and, if done correctly, it would tap into the zeitgeist and become part of the culture. This has been the dominate advertising paradigm for the last 50 years. With the advent of TV and radio, advertisers were in the position to deliver their messaging at scale. For the first time ever, there was the possibility to overcome randomness with enough advertising and money. In 2014, the global advertising spend exceeded $575 Billion and is growing at a healthy 8% per year. In the US for example, advertisers spend $565 dollars per person, per year on paid media. Unfortunately, most business models expand to a point of absurdity and then collapse. I’m not saying that the ad business is going to collapse… at least not yet, but we’ve reached a point where the number of touch points, channels and outlets have become too expensive to dominate. The result is a chaotic mess of ads seeking to capture your attention. The model of frequency and reach is now reserved for only the wealthiest of brands. This is where disruption begins. Because the expense is too high, innovation is required to achieve similar outcomes. Tahzoo is a byproduct of this next wave of disruption. We are helping our clients transition into a new way of doing business. I talk and write often about personalized and relevant content, well this is a way for marketers to break through the clutter and engage audiences. A new paradigm for the 21st century that ironically has its roots in a more traditional business model of knowing your customers and building personal relationships. No longer do they have to deliver a one size fits all, lowest-common-denominator message to the broadest audience. They can now begin to transform the digital customer experience into something personal and relevant. Seeing this change in the marketplace is what compelled me to start Tahzoo. I was excited because I could see the change coming and I knew if we built a company with the right expertise, we’d be relied on by our clients to help them change. This is really what digital transformation is all about and what Tahzoo is all about. The way that Tahzoo uses data to understand customers and their expectation of the customer experience is unique. We see people in the context of the type and style of content they prefer to consume. We use data from many different sources, web analytics, social data and behavioral data to understand the format and then the semiotics of the content required to influence behavior or provide a more pleasing experience. With our ability to implement sophisticated content management systems, we can use insight and data to deliver a differentiated customer experience. This is markedly different than the traditional model of understanding people by age or income or other demographic metric. With the rise of the web, agencies moved to personas rather than demographic models, however they are utilized to inform the creative experience and not the personal experience. We use data to understand people or discreet audiences, in an effort to provide a more pleasing customer experience. We are actively seeking to understand the models of engagement. 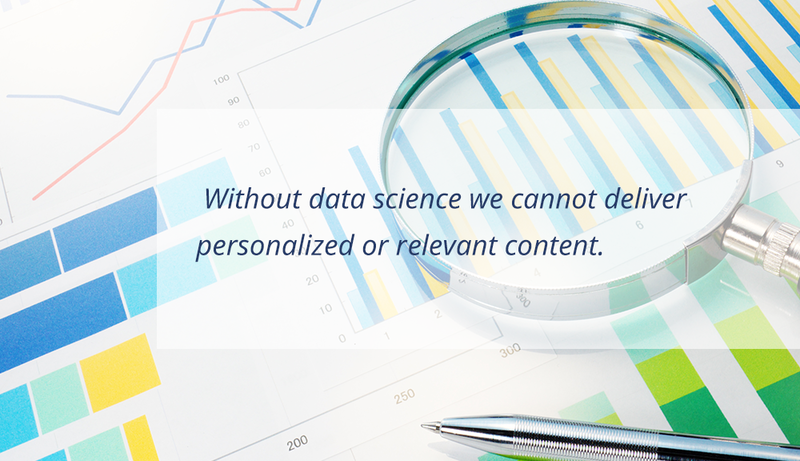 Without data science we cannot deliver personalized or relevant content. We are more or less guessing. With all the talk of “Big Data,” the real trick is to make the data actionable. If we combine our expertise in building the integrated marketing platform with great data science, we create the possibility of truly connected experiences. We need to continue to innovate in this area and focus on bringing the art of the possible together for our clients. The future of Tahzoo depends on it.